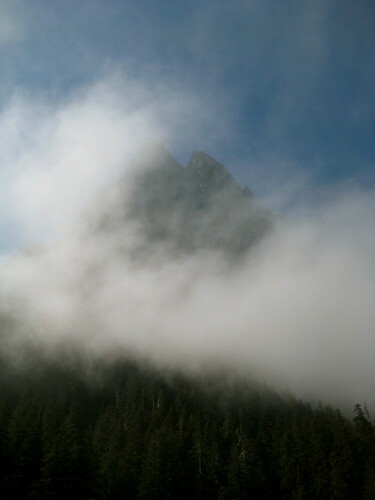 The Wild Sky Wilderness of the Baker-Snoqualmie National Forest is the newest wilderness area in these parts. It received a lot of hullabaloo last year when it was officially designated. There aren’t many trails, but the area offers much to explore. Towards the end of this spring, I took my first trip into the Wild Sky, choosing to visit Eagle Lake. The lake is only at about 4,000 feet, but winter seemed to cling to it despite the season and conditions not a thousand feet below. On this first visit, the edges of the lake were still frozen over and the surrounding meadow covered by four feet of snow. I had not learned much about the area before venturing into it and so was surprised to find an old cabin on the eastern side of the lake. It was apparently built sometime around the 1950s for the Forest Service. They’ve since abandoned it, leaving the cabin to be maintained by locals who visit the area frequently. It houses a couple beds, wood stove, cooking implements, wood working tools, warm clothing, a bit of food, and other odds and ends that people have supplied. I spent one comfortable night in the cabin on my first visit and decided that I would like to visit the area again sometime after snow melt. Earlier this week I made a short trip to accomplish that, spending two nights in the area to celebrate the Autumnal Equinox and the equality of day and night. I had no particular goals in mind for the trip and did not intend to log much distance over the few days. The hike in started on a short, 2-mile trail to Barclay Lake. I was surprised at how dry the lake had become since my previous visit. The lake looked to hold only half as much water as before, exposing logs and boulders on one end and a grassy meadow on the other. 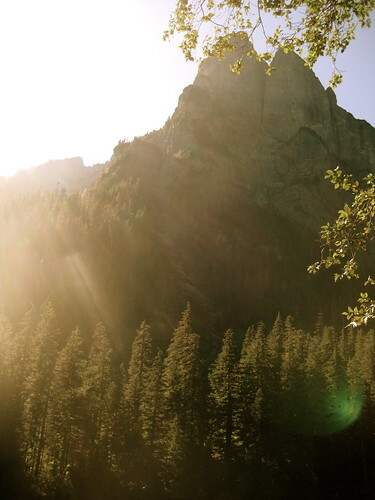 Baring Mountain still towered above the area, sunning its harsh, 3,000 foot northern face. From Barclay, I left the trail and made my way north up a ridge to the small – and seemingly always extraordinarily cold – Stone Lake. After Stone Lake, I headed northwest a short distance through Paradise Meadow to my destination of Eagle Lake, all told only another 2 miles from Barclay. The way from Stone Lake to Eagle Lake through Paradise Meadow was a much easier and more pleasant jaunt with a good covering of snow on the ground. Now, the meadow was a muddy bog that warranted careful attention be paid to each footstep, lest I find my boots submerged in mud. I was glad that I had not decided to come back to the area in July or August, as the meadow looked a perfect place for bugs. (Indeed, I thought to myself that Paradise Meadow was probably named by mosquitoes.) As it was, the year had aged enough that there were no biting insects about. But for that fact and the shortness of the day, it could easily have been midsummer. The skies were clear, the country green, and temperatures somewhere around 80 degrees Fahrenheit. Arriving at the lake at mid-afternoon, I reported to the cabin and found it all in good order. But the day was warm and the night promised to be clear. I could find no reason to spend it in a box. 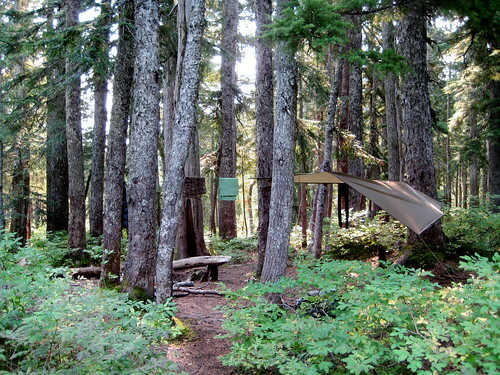 So I left the cabin and found a well suited site for my tarp on the shore of the lake, a ways down from the cabin. The remainder of the afternoon and evening was spent with hatchet, knife, and saw, preparing the first fire of the season and kindling the blaze against the coming darker months. That night, I cooked a small dinner on the fire, enjoyed the flame, and went to bed. I slept in late the next morning, not crawling out of my sleeping bag till 9:30 AM. It looked to be another fine day. It was supposed to be the first day of Fall, but this country didn’t know it yet. After breakfast, I lounged around the lake, explored the neighboring ridges and some more of the meadow. Near 1 PM, I thought about where I would like to spend the night. 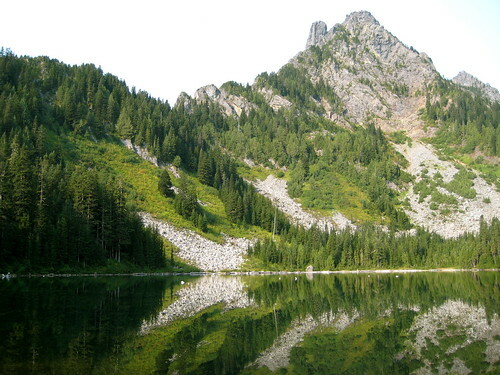 Initially I had thought that I would spend it at Eagle Lake once more, either in the cabin or in another spot near the lake, but this trip marked the second time I had walked past Barclay Lake without much of a pause there. It had always seemed a nice spot to me, despite its close proximity to the trailhead. There would be little chance of encountering many people at Barclay, it being the middle of the week and summer now over. I decided I would try a night down there. Working my way back down to Barclay was a sweaty affair. I encouraged myself along the way by thinking that I could jump in the lake to wash and cool off at the end of it. When I finally made my way back down and arrived at Barclay it was still plenty light, but I was disappointed to find that the sun had already gone behind Baring Mountain. No matter, I thought, and, stripping down to my underwear, jumped in. It was cold. Cold enough to make me think it a surprise that there wasn’t any ice on the surface. My time in the lake was shorter than I had previously expected. I had already laid out my nice, warm, merino wool baselayers before jumping in, and eagerly put them on after drying off. 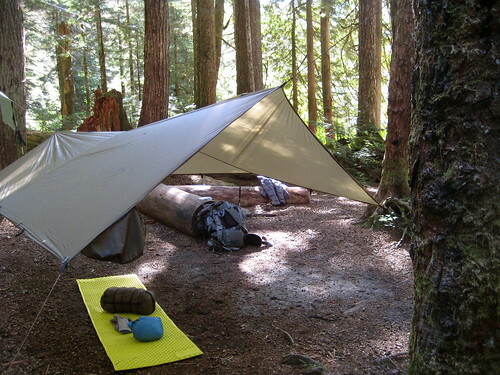 The lake had left me feeling refreshed, and I went off to find a suitable spot to hang my tarp for the night. I cooked and ate dinner as the land darkened. Just before dusk I heard a strange sound and looked up in time to see a chute open. Two people had jumped off the top of Baring and para-glided down to the meadow on the eastern side of the lake. Soon after, I retreated to bed and went off to another satisfying sleep. Next morning I woke up early, but stayed in my sleeping bag reading till around 9. It was another slow morning, with not much of anything occurring besides breakfast. Laying on the beach of the lake just before noon I spotted a small wisp of cloud in the west. It was creeping in on an otherwise spotless sky. No more than 15 minutes later, the valley was filled with fog. Fall had finally arrived, I thought, and took that as my cue to break camp and head off back to the trailhead. This post was published on 2009-09-25 . It was modified on 2012-09-15 . It was tagged with wilderness.